FILE - Armed police officers point as they stand at the ready close to a cafe under siege at Martin Place in Sydney, Australia, Dec. 15, 2014. Australia on Tuesday released what the government says is the world's first how-to guide for combating radical Islamist propaganda in Southeast Asia, which it hopes will help disrupt local recruitment efforts by groups such as Islamic State. Australia, a staunch U.S. ally, has been on heightened alert for attacks by homegrown Islamist radicals since 2014 and authorities say they have thwarted a number of plots. The 43-page document, entitled "Undermining Violent Extremist Narratives in South East Asia," will be accessible online and aims to provide tools to disrupt the winding path to radicalization, said Justice Minister Michael Keenan. "The process of radicalization to violence is an incredibly complex issue. Terrorist propaganda affects each individual's state of mind, their thoughts and emotions differently. There is no single pathway to radicalization," Keenan told a conference in Canberra, according to an advanced copy of his remarks shared with Reuters. 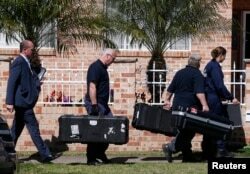 FILE - Members of the Australian Federal Police (AFP) forensic unit carry equipment into a house that was involved in pre-dawn raids in the western Sydney suburb of Guilford, Sept. 18, 2014. Without referring to specifics, Prime Minister Tony Abbott said Australia was at "serious risk from a terrorist attack." "This compendium provides practical guidance and insight for governments, policy makers and civil society organizations in Australia and Southeast Asia to support their development of effective counter-narratives that undercut the appeal of terrorist propaganda." The document does not make for light reading. It contains tips for a successful strategy such as "protect the messenger" and "consider how military and counter-terrorism actions impact the strategic counter-narrative." It also offers case studies and examples, such as the Burqa Avenger cartoon in Pakistan, in which a teenage Muslim heroine battles extremist villains with books, analyzing their success in countering narratives put forward by increasingly media-savvy militant groups. Canberra has been increasingly focused in recent years on preventing the spread of militant Islamism to its neighbors in Southeast Asia, which have large Muslim populations and, it is feared, could link up with its own homegrown militants. There have been several "lone wolf" assaults in Australia, including a 2014 cafe siege in Sydney that left two hostages and the gunman dead. Also in 2014, police shot dead a Melbourne teenager after he stabbed two counterterrorism officers.